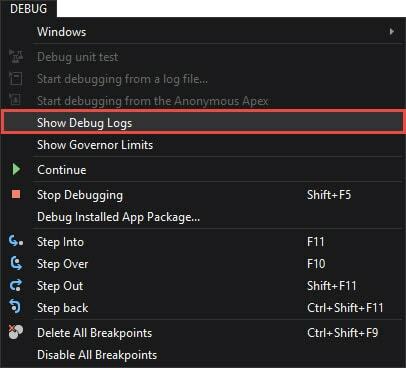 Debugging a unit test, log file, or an Anonymous Apex file step-by-step is very helpful to understand, how your code really works, and catch every issue. At the same time, it's essential to trace the concrete line of a log file at every step of the execution flow. You can accomplish this with the help of Debug Logs window in the Debug mode of The Welkin Suite. To open this window, in the Debug mode of The Welkin Suite, navigate to the Main Menu: Debug ⇒ Show Debug Logs. 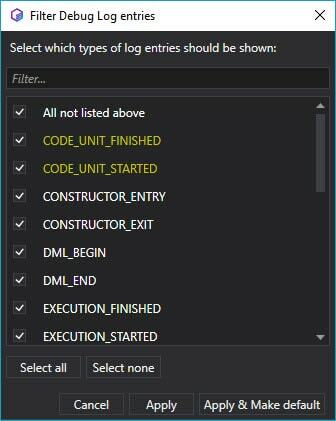 The Debug Logs window displays log lines, that were created between the previous and the current step. The log lines are dynamically replaced after every next step by the new ones. If you want to trace all the log file, without breaks, toggle the Append mode button at the top of the window. To clear the window, click the Clear button. 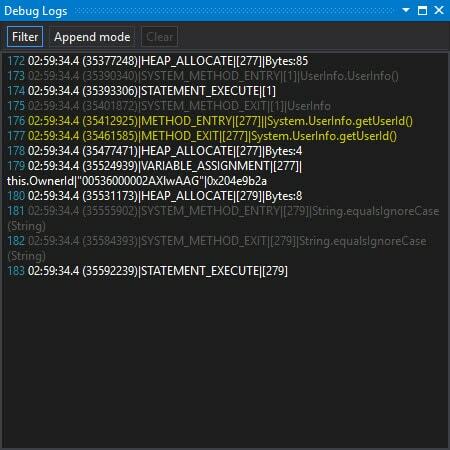 All the events in the log file are highlighted in a standard way, as in the Debug Logs Viewer. In addition, you can also filter the events by their types: click on the Filter button. This list includes only the types, that are present in the current log file. Check the necessary types of events (or use the Select all / Select none options for quick adjusting) and click the Apply button. You can search for the events using the filter input above the list — just start typing a name of a type. If you often use the same setting for filtering the log events, use the Apply and Make default button. All the next log files, opened in the Debug logs window during the current session, will use this filter. NB: If you press Enter in the Filter window, this action will accomplish the Apply and Make default action. not the Apply one.